On my second trip to Mérida, I was all about architectural details. It made for a fun change of pace in a city filled with color and old world colonial charm. The light that day was also exceptional as you can tell by the vivid red wall surrounding that classic old wooden door. The color really pops doesn’t it? This door jumped out at me not just because of the ornate details but the generous size of the architecture. It clearly came from an era long before doors came off of a conveyor belt in a factory somewhere. Even the trim work around that old wooden door is big and impressive. Someone was definitely trying to make as statement when they made this old wooden door long ago. This is old Mexico in a nutshell for me. This classic old wooden door is a beautiful example of handcrafted architecture set amidst the colors for which life south of the border is known. It’s a reminder both of the history of the country as well as the zest for life of the people that is part of Mexican culture. And that old door not only speaks of the history of Mexico. It tells the story of the people who lived behind those thick red walls for generations in the city of Mérida. Does this classic old wooden door print tell stories to you as well when you look at it? Does it remind you of time spent in Mérida or perhaps Mexico in general? 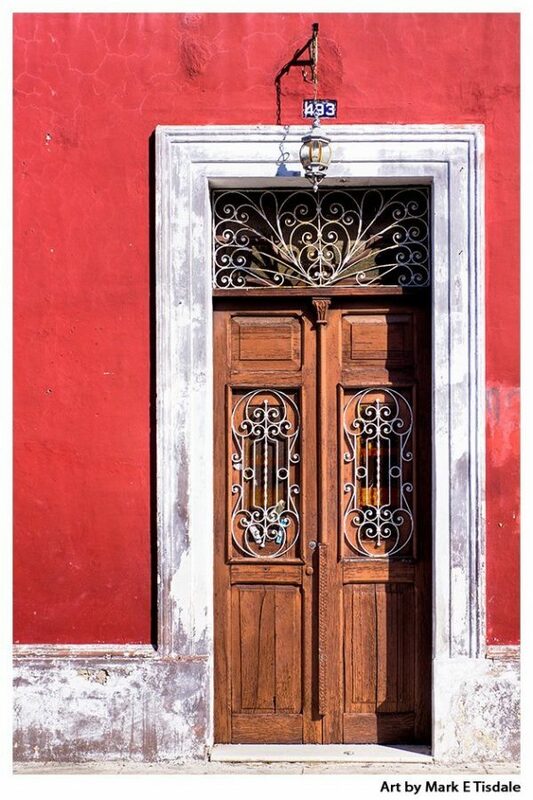 Or does your attraction to this Mexican architecture boil down to the vivid color and bold lines of that ornate old wooden door? I hope you might take a few moments to tell me what details caught your eye in this classic Mexican scene from the streets of Mérida.